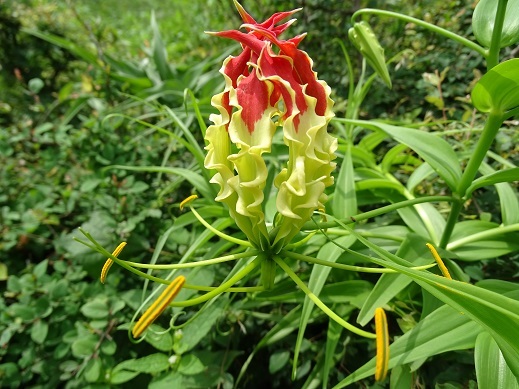 Medicinal Uses of Gloriosa superba (Flame lily). Gloriosa superba (Flame lily) complete detail. 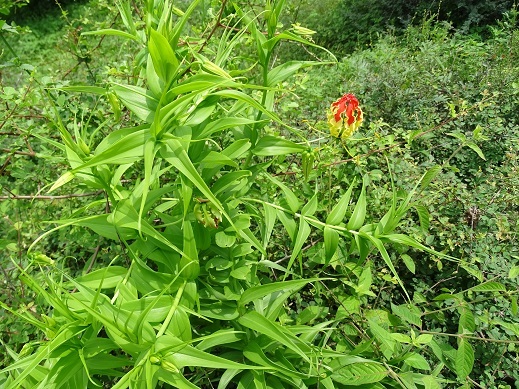 Habit and habitat of Gloriosa superba (Flame lily). Flame lily is a perennial tuberous climbing herb. They prefer tropical forest. It is a beautiful ornamental plant. Flame lily is the National flower of Zimbabwe. The length of flame lily is between 3 to 6 meters, and trained at 1.5 meter above the ground level. The stem is leafy. The color of flower is ranging from red with yellow margins to very pale yellow forms with a mauve or purple stripe, pale white forms also occur. Flowers are 6 to 10 cm long, and 1 to 2.5 cm wide. The pedicel be up to 20 cm long. Flower has 6 stamens, the length of stamens is between 3 to 4 cm, and each bears a large anther at the tip that drops large amounts of yellow pollen. The fruit is a large, oblong capsule, 6 to 12 cm long, and containing about 20 globose red colored seeds in each valve…………. Flame lily has many medicinal properties like colchicine, gloriosine, pungent, bitter, acrid, heating, anthelmintic, laxative, alexiteric, abortifacient etc. 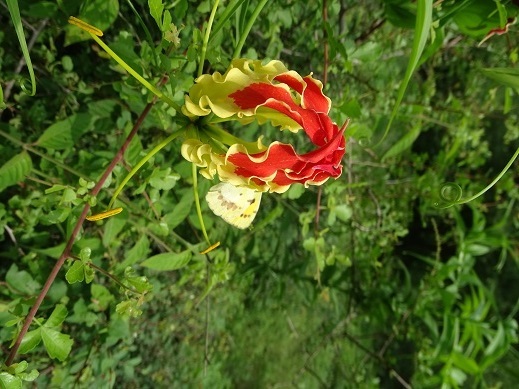 Flame lily also used as a tonic, anti-periodic, anti- helminthic, anthelmintic, and laxative. The tuber has commonly been used as a suicidal agent among women in rural areas and it has also been used for homicide. The flowers are used in religious ceremonies. 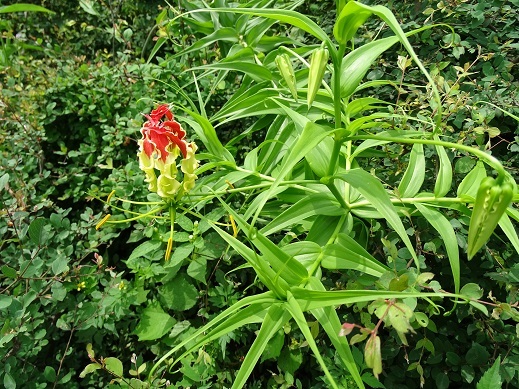 Gloriosa superba is a perennial tuberous climbing herb. It is a beautiful ornamental plant. Flame lily is the National flower of Zimbabwe. The length of flame lily is between 3 to 6 meters, and trained at 1.5 meter above the ground level. The stem is leafy. The vines are tall, semi hard stemmed with tuberous roots that support themselves by means of cirrhosed tips. 1 to 4 stems arise from a single V-shaped fleshy cylindrical tuber. Leaves are sessile, lanceolate, acuminate, entire, glabrous, alternate, lance shaped and tipped with tendrils. The leaves are 5 to 15 cm long, and 3 to 5 cm wide, and bright green in color. The leaf blade has strong, parallel nerves and ends in a tendril-like spiral. Flowering period is between July to October. Flowers are bright, large, showy, long stalked, bisexual, and axillary. The color of flower is ranging from red with yellow margins to very pale yellow forms with a mauve or purple stripe, pale white forms also occur. Flowers are 6 to 10 cm long, and 1 to 2.5 cm wide. The pedicel be up to 20 cm long. Flower has 6 stamens, the length of stamens is between 3 to 4 cm, and each bears a large anther at the tip that drops large amounts of yellow pollen. The fruit is a large, oblong capsule, 6 to 12 cm long, and containing about 20 globose red colored seeds in each valve. Flame lily found in southern Africa, India, Sri Lanka, Malaysia, and Burma. It is also planted outdoors in the southern United States. In India Flame lily is found in Rajasthan, Maharashtra, Karnataka, Kerala, Tamil Nadu, Goa, and few other parts. In warm tropical countries it occurs in thickets, bush land, forest edges and cultivated areas. It occurs from sea-level up to 2,500 meter, and propagated from seeds take three to four years to bloom. 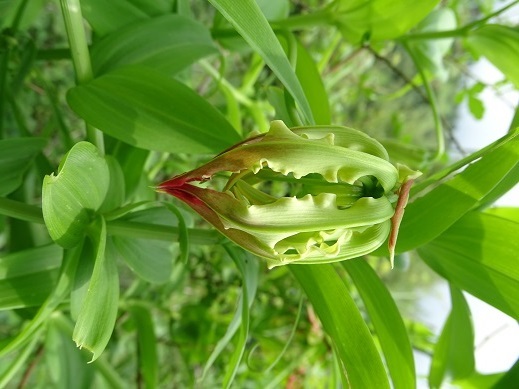 Gloriosa superba is also propagated vegetatively. Flame lily is pollinated by butterflies and sun birds. Flame lily is a poisonous plant, due to presence of toxic alkaloid like colchicine. All parts of the plant, (stem, leaves, flowers, fruits, and tubers) are poisonous, but tubers are extremely poisonous. The toxicity of this plant is enough to cause human and animal fatalities if ingested. Within a few hours of the ingestion of a toxic amount of plant material, a victim may experience nausea, vomiting, numbness, and tingling around the mouth, burning in the throat, abdominal pain, and bloody diarrhea, which leads to dehydration. Flame lily has many medicinal properties like colchicine, gloriosine, pungent, bitter, acrid, heating, anthelmintic, laxative, alexiteric, abortifacient etc. Flame lily used in the treatment of snake bites, scorpion stings, parasitic skin diseases, urological pains, colic, chronic ulcers, piles, gonorrhoea, gout, infertility, wounds, arthritis, cholera, kidney problems, typhus, itching, leprosy, cancer, nocturnal emission, abdominal pains, head lice, sexually transmitted diseases, and many other diseases. 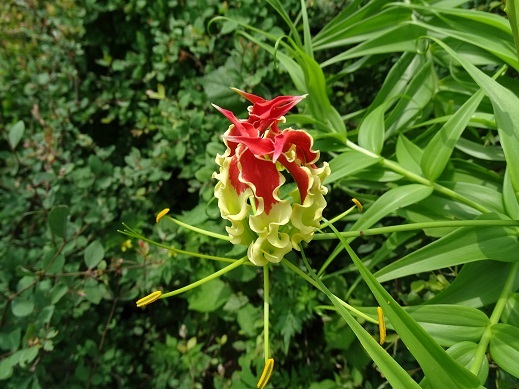 Flame lily also used as a tonic, anti-periodic, anti- helminthic, anthelmintic, and laxative. The drug is sometimes used for promoting labor pains. The leaves when applied in the form of a paste to the forehead and neck, are reported to cure asthma in children. The leaf juice is used against head lice, and also as an ingredient in arrow poisons. The sap from the leaf tip is used for pimples and skin eruptions. Colchicine is widely used as an experimental tool in the study of cell division, as it can inhibit mitosis, induce polyploidy, and has been used in the treatment of cancer. The tuber has commonly been used as a suicidal agent among women in rural areas and it has also been used for homicide. The flowers are used in religious ceremonies.